The Ducks beat Kansas Saturday with defense and because they rebounded. There’s so much to love about that win, and as coach Dana Altman pointed out, a few things to work on as they get ready for North Carolina in the Final Four. 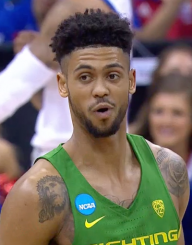 Tyler Dorsey’s great first half gave the Ducks a cushion, momentum and belief that they could score against the Jayhawks. He didn’t call the bank at the half but when you’re that hot you just let it fly. This video shows how hot Dorsey was. Oregon knew to get it to him and they did. Why they went away from him in the second half is something Altman will address for sure in the next few days. 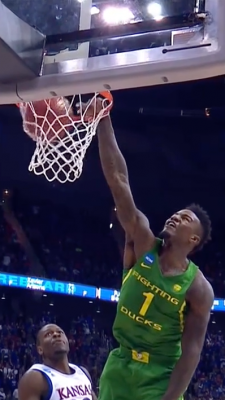 Jordan Bell blocked 8 shots, altered another half-dozen and did it the same way every game. Here’s the video of all 8 blocks. By waiting for the shooter to leave his feet, he used his ability to get up – quickly – and his 7-foot wingspan was the difference-maker. Didn’t matter who the shooter was, he waited, took great angles or went straight up. Referees saw that and gave him the benefit of the doubt down low and often just watched his hands. Bell blocks Landon Lucas from behind. Rebounding at this level is mostly heart. Yes, Bell had 13, but … the Ducks had 3 other guys with 5 rebounds. Dillon Brooks, Payton Pritchard and Dorsey. None of them averaged more than 3.5 a game during the regular season. So when Bell altered shots, guards were crashing down to rebound. That’s a huge difference in the game right there. Oregon out-rebounded the Jayhawks 36-32 and those 15 boards from the starting guards were game-changers. Kansas still had 12 offensive rebounds, but they missed 39 shots and only got 12 of them back. That’s a solid job by the Ducks. Oregon’s overall defensive approach was terrific. It’s basic math, or Geometry if you will. The Ducks used their length and quickness on the perimeter, with four aggressive guards/wings to contest all shooters on the perimeter, make them drive and force anyone to take an angle to the edge of the backboard. If the driver is going straight at the rim, Bell has no angle to block or contest the shot. But every Duck did a great job of sending someone toward the corner of the backboard. With that angle Bell’s length and quickness off his feet allowed him to get to a lot of shots. As we all saw. When Josh Jackson got his second foul – and it seemed as if he didn’t know how to play with fouls – the Ducks took it at him a couple times, but his offensive aggression just went away. Maybe that’s being a freshman on a huge stage. He’s still 18, and it’s easy to get tight if you haven’t been there before. Bell blocked 8 shots and stayed out of foul trouble. Jackson drew a couple fouls and didn’t know how to be effective while playing with them. Brooks had 2 fouls, as usual, but he played through it and was semi-effective in second half. Kansas’ Devonte Graham scored just 3 points, all on free throws, in 38 minutes. And 0-6 from 3-point line. Against Purdue he had 26 points. Oregon made him go 0-7 from the field. He had 2 more turnovers than field goals. An atrocious game for him, because he was hounded by Dylan Ennis and Pritchard. Oregon swarmed him and never let him get going. He’s the third or fourth scorer for the Jayhawks, but when he didn’t get going, it all fell to Frank Mason III and Jackson. Hard to complain when you won your first Elite 8 game in 78 years, but Oregon’s game wasn’t perfect by a long shot. Brooks decided to play hero ball for about 7 minutes in the second half, and they forgot Dorsey existed. Dorsey destroyed the Jayhawks, but Oregon didn’t run many second half plays for him. Credit the Jayhawk defense for a stretch, but Oregon barely tried. Oregon ran clock and looked horrible on offense, just horrible. Commentator Charles Barkley rightly called them out afterward. Bell’s game has grown so fast, he’s now a possible 1st-round pick in June. Oregon’s defense bailed them out during that stretch. (See above.) Dorsey hit a well-contested deep shot from the wing for a 3 that was an NBA shot, but for the most part the offense was stagnant. Why? No Chris Boucher. 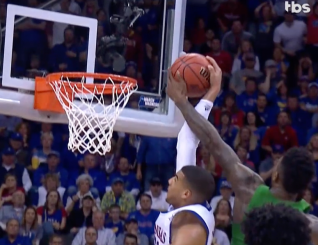 Kansas left Ennis open and covered the other four. Ennis shot it better than he has lately, but Kansas designated he and Casey Benson as the guys they’d leave open on the rotation, and they blanketed everyone else. Boucher spotted up in the corner would’ve changed that. With that option gone, Oregon needed to run back door plays, lobs and other back cuts to make defenses pay for over-pressuring at the top. Coach Altman addressed it immediately in the locker room, saying they got away from setting solid screens and running the motion offense. Benson and Pritchard struggled to establish the offense at the top of the key as Mason made them start the offense 10 ft. farther away from the bucket. They’ll have to be tougher next Saturday, because North Carolina will try to do the same. The Ducks have all the tools to win it. They’ll be a semi-final underdog and out-manned at a couple spots on the floor. But if they play the same defense, stay out of foul trouble and run their offense for 40 minutes, they can beat anyone. Sunset High’s Landon Lucas ended his career by losing to Oregon, the alma mater of both his parents. His father Richard played at Oregon, his mother Shelly had said she loved the Ducks but hey, it’s her son. We understand, Shelly. We understand. Landon took to twitter to show how sorry he was to end his career this way. 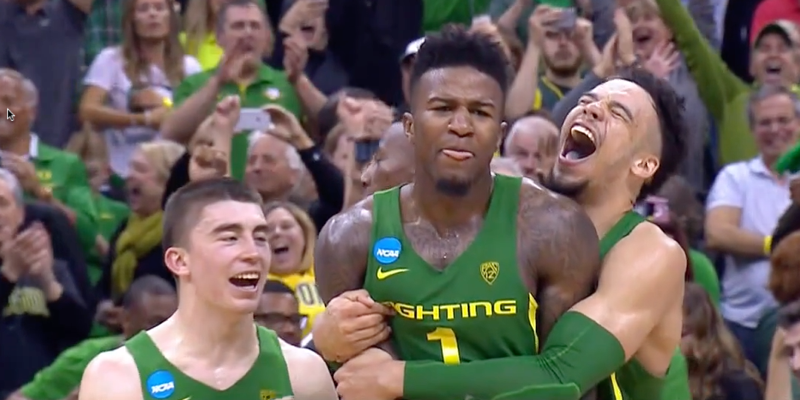 Bell’s interview on CBS immediately after the game re-affirmed the longstanding belief that Oregon’s athletes support each other in an unusually strong way. Bell spoke of how the Oregon men’s team is inspired by the Oregon women’s basketball team, the indoor track team’s national title, the softball team’s run and all the other programs at Oregon. Dana Altman now has 595 Division 1 wins. The Kansas win pushed him past Georgetown’s John Thompson on the all-time coaching win list. He’s tied with Dr. Tom Davis and just two wins behind Slats Gil of Oregon State. How coachable is this group of Ducks? Brooks describes how they saw Reggie Miller during shootaround and asked him for any advice he had. More proof that group will look for any way to get better. Leadership? Altman praised Bell for his on Saturday. Turning point of the season? Brooks said it was Oregon’s loss at Colorado. Oregon treated it like a road game. Afterward Coach Altman said they walked the team out for the Purdue game on Thursday so they could see and hear the crowd for Kansas. They wanted them to really understand it’s just like facing Arizona, or Washington or UCLA on the road. Same thing. Road game. Altman is terrific in his ability to anchor this as a road game in the minds of his players and it made a difference, without a doubt.